We went to the beach today. It seemed like a good idea at the time – the children’s centre were renting a beach hut, there’d be activities for the kids and friends for me to chat to, in theory a lovely day. In reality it turned into a day from which each participant emerged with a different story. Eli would tell you that he had a good time (mostly). 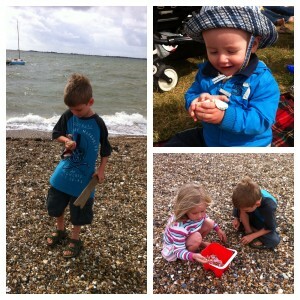 He sat on a picnic blanket near the beach and played with shells, spades and pebbles. He had a box of snacks (but would have preferred the snacks his siblings had). At the café he chatted to the other babies and was most put out at not being allowed to crawl about on the, frankly, very grubby floor. He then enjoyed a lovely cuddly sleep in the sling as we walked down the beach before heading home and singing and chatting to Lex in the car. Tilly and Lex would also tell you how much fun they had. They dug in the pebbles and collected as many shells as possible (although were somewhat disappointed to be limited to taking home two each). Tilly enjoyed the opportunity for some sticking and drawing in the beach hut. They had hot chocolate with both cream and marshmallows in the café and were allowed to chill out with the iPhones whilst the adults chatted and relaxed out of the wind. They then had a chance to run down the beach and explore the exposed rock pools which was fun even if there weren’t any crabs or fish to be seen. All the fresh air meant heading home, cuddled under coats in the car, was a nice time to rest rather than an end to all joy and fun (as it often is). 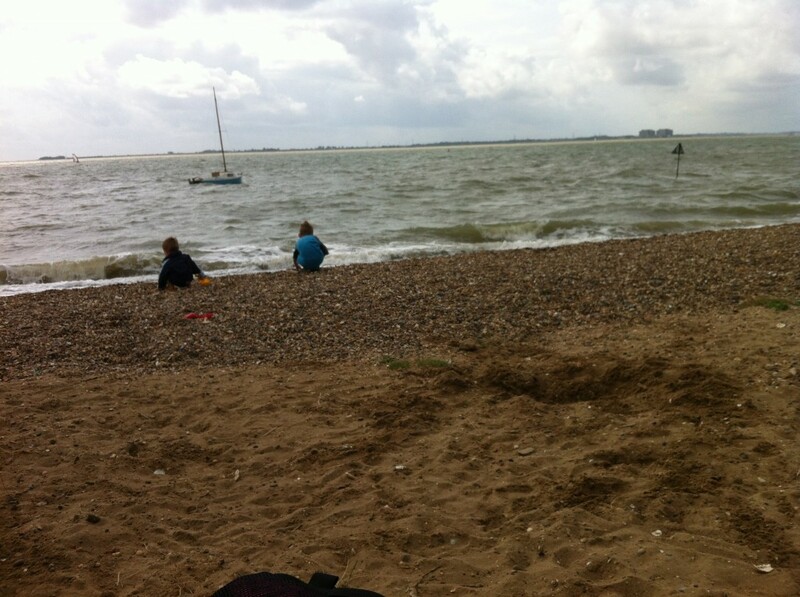 I had a reasonably good time, sitting with Eli on the beach, chatting to my friends and watching the big kids have a good time. The wind was annoying but on a pebbly, muddy beach at least there was no sand flying into my eyes (except when toddlers digging in front of us threw it in the air but I blame the parents for that). The most entertaining part was on the drive in when, on a narrow stretch of road on which we had priority, an older woman coming the other direction decided to try to push through. There was nowhere for her to go and no amount of her gesturing and driving at the car in front of us made it possible for her to pass us or us to pass her. The stalemate was only ended by R getting out of the car and pointing out to her the priority sign showing she was in the wrong. At that point, with much unhappiness, she made a complete hash of reversing back through the bollards that marked the start of the narrowing, to allow us to pass. She acknowledged R’s cheery wave with what I can only imagine were words not meant for young ears. The incident is still making me chortle hours later. R did not have a great time. I don’t think watching the big kids whilst I socialise is his idea of a great time. Tilly spilling his drink and Lex dropping his phone on the floor weren’t happy moments either. He was especially narked when, trying to type in his pin code to pay for drinks, Tilly’s constant chatter flummoxed him and caused him to freeze his card through incorrect pin entry. His only happy moment (aside from unable to read signs lady on the way in) was probably when we left and just missed being soaked by rain. The drive back even annoyed him when a learner driver was sent to try his remaining patience. So, 9/10 for the kids, 7/10 for me (the wind knocked a few points off) and about 2/10 (if we count the old lady as 2) for R.
How often do you manage a family day out where everybody has a good time? We achieve it occasionally but it often seems that at least one person will have a miserable time despite the activities. I’m guessing as the kids get older and their interests diverge it will become even more tricky. Still, at least kids (unlike grown-ups) are relatively easy to entertain even if it is overcast and windy digging in pebbles is great fun! This entry was posted in Bits and bobs, Kids and tagged beach, children's centre, eli, lex, summer, tilly by twigletmac. Bookmark the permalink.